WHETHER YOU HAVE ONE CLINIC OR 100! "I prefer to work with vendors that truly care about the future of chiropractic." that don’t show what I care about." and I need the best tool for my business." 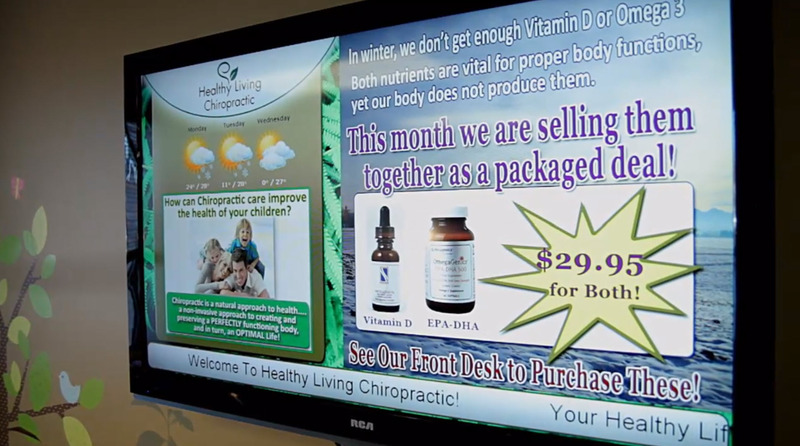 THE CHIROCHANNEL was built by a team of digital signage experts that share a passion for chiropractic care. Nowadays, you can’t walk in to a chiropractic waiting room without seeing a TV on the wall. It’s an untapped marketing tool that goes beyond chiropractic posters, DVDs, spinal charts and other chiropractic patient education materials. Our custom designed, waiting room TV channel turns your chiropractic brochures into dynamic educational videos, showing your own advertisements, your techniques, testimonials, and more…all while strengthening your brand.